Fire Danger ratings are an effective part of daily risk rating and operational preparedness for fire management agencies across the world. Chapter 10 – Preparedness of the Interagency Standards for Fire and Fire Aviation Operations outlines processes and resources applied in the development of standard Fire Danger Operating Plans in the United States. Specification of fire danger ratings. Identification of climatological thresholds for administrative purposes. Default thresholds include the 90th and 97th percentile values for key indices in the applied system. The Bureau of Land Management (Department of Interior) uses the 80th and 95th percentiles instead. Communication of those danger ratings, including both internal and external forms. 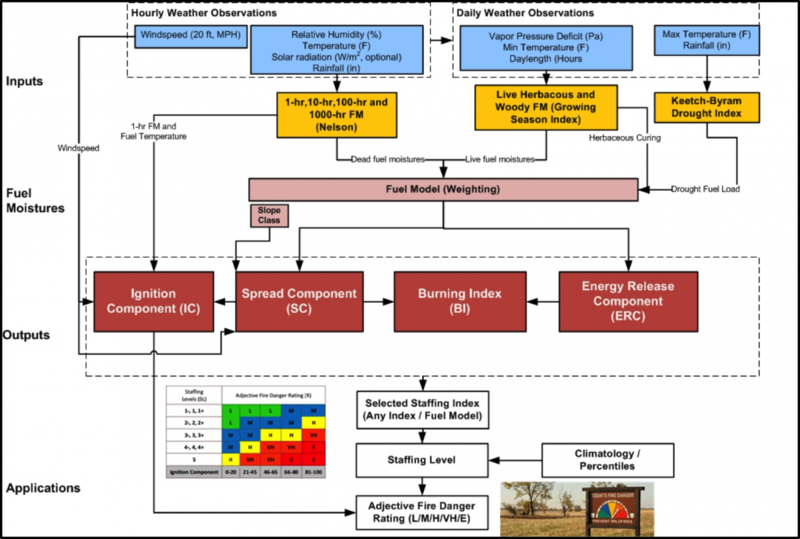 A variety of fire weather systems are applied in danger rating around the United States. There are primarily two systems used in fire danger operating plans. Other tools, formulations, and applications are used locally across the country. Some examples are highlighted later, in the Fire Danger References Section. 1 hour = 10 hour? Herbaceous and Woody Fuel Moisture Content Herb fuels classified as dead when dormant. Transition from dormant/deal fuel moisture to live/full green-up based on climate class in spring 1000 hour based live moisture trend and load transfer Herb fuels classified as dead when dormant. Season/Greenness factor based live fuel moisture trend/load transfer unless fuels declared dormant. Herb fuels classed as dead when dormant. Green Season/Live Fuel Index based moisture trend and load transfer. Drought Fuel Load Transfer KBDI used to signal initiation and amount of fuel load transfer. 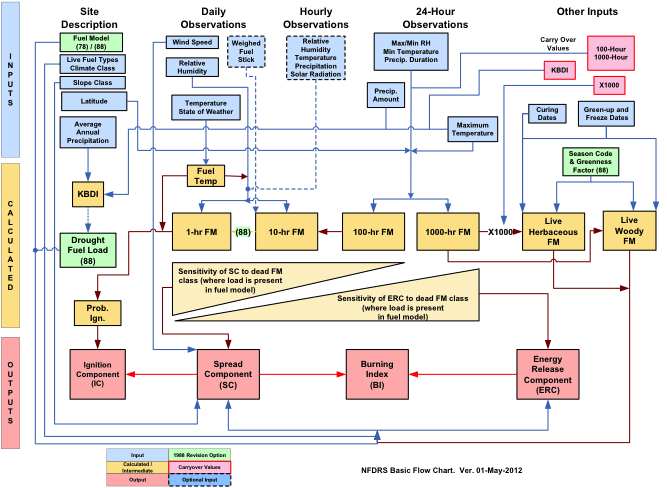 KBDI used to signal initiation and amount of fuel load transfer. SC, IC, ERC, BI Models unchanged. Outputs will vary based on differences from new fuel moisture models and new fuel model definitions. Models unchanged. Outputs will vary based on differences from new fuel moisture models and new fuel model definitions.